Is your community prepared to respond to another Hurricane Juan, or another White Juan. Or perhaps a fire like the one at Porter's Lake? Joint Emergency Management (JEM) is a concept developed by Halifax Regional Municipality's Emergency Management Office (EMO) to allow communities to prepare for and respond quickly to a wide range of emergencies, In times of crises, EMO will activate JEM Support Centres (JSC) to coordinate humanitarian response. This unique HRM concept is based on the principle of "neighbour helping neighbour". In the critical hours following a crisis situation, while local and provincial response agencies are dealing with the immediate and urgent needs of the municipality, residents in affected communities need to be prepared to help themselves and to assist their neighbours, who may have been seriously impacted by the event. It is during this period that the JEM will be activated and will mobilize local resources in coordination with HEM EMO staff. In the event that an emergency occurs in your area, The Prospect Road Community Centre can be designated to become a Comfort Centre, a Reception Centre, or even a provincially organized Evacuation Centre. To prepare for such an event, JEM is looking for local citizens and groups interested in serving their community as comfort centre managers and support staff. Training will be provided. Those that wish to become volunteers will have the option of continuing training such as First Aid and Food Handling. My comments are as follows: Only eight more meetings are available to the public if one looks at the Shape Your City Halifax Solid Waste Management website as of today (Friday Sep 20, 2013). There are also four "stakeholder" meetings which are not detailed with date, location and times on the aforementioned website, but I am not sure if public attendance at those venues is allowed or indeed wanted. As for allowing changes to Otter Lake; everyone I know would not be against improvements that bettered the performance and output of the Front End Processor (FEP) and Waste Stabilization Facility (WSF) protective services. Contrary to the Stantec report, and HRM's continued musings, the FEP & WSF are essential to providing the best processing and management of the solid waste materials that come to the Otter Lake facility. Even when the Otter Lake facility closes (sometime around 2023-2024), the next landfill will require these services to operate effectively, and to protect residents and the environment. The only technology that could possibly replace them is one that renders all the waste material it processes into inert matter that poses no threat to the environment or public health. There are a few such technologies being touted around the world, but not many have full size solid waste processing facilities in operation at this time; so these technologies though they look promising, are but a pipe dream at this time. 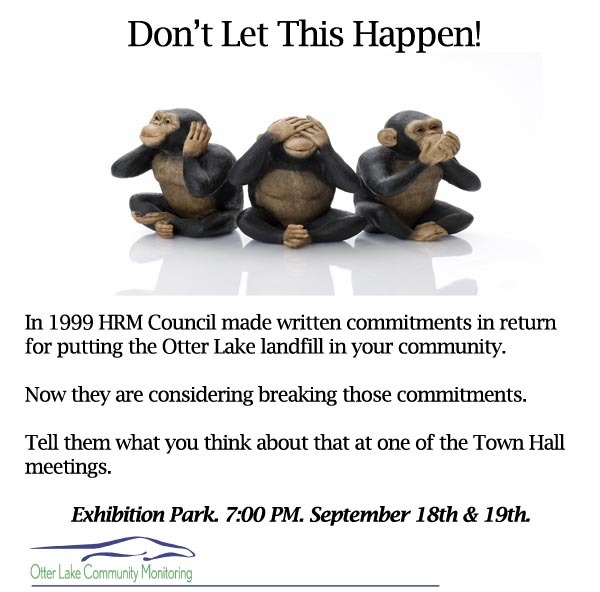 HRM Council & Staff should be proud that the public is willing to fund the operations at the World Class Otter Lake facility; but instead, by their actions thus far, they seem to be bent on turning back the clock and going to a "common landfill" arrangement… even though they say no decision has been made. Perhaps Council has an open mind, but they are allowing a flawed public engagement process to continue to spread false information, and are asking the public to make an "informed decision" based on tainted "facts".. In 1995, the public said quite clearly that a common landfill would NEVER again be allowed to operate within HRM, when public participants as part of the Community Stakeholders Committee created the "Integrated Waste/Resource Management Study" document. It is the concepts found in this document that have provided us with the excellent solid waste management solution we have today. Is this solution perfect, no. Has it reached all its goals, not yet, but it is still moving toward achieving them. Today's Otter Lake landfill implementation provides a far better foundation to build on in order to improve on how solid waste materials are processed in the future. Way better than returning to commonly used technologies and processes that are still shown to be less than acceptable when we look at how most other North American municipalities manage their solid waste materials. We want to move forward, not backwards. And we have existing signed legal Agreements between the Public & HRM, and HRM & the Landfill Operator (Mirror NS), that if honoured will continue to keep Otter Lake operating safely until this landfill site is retired. All Provincial parties have spoken through a unanimous resolution in the NS Legislature that they support keeping Otter Lake's protective services in place, and the NS Environment Minister a said this in a letter sent to the Mayor. So one wonders why does HRM keep moving forward with their assault on Otter Lake, what is their justification? HRM's Deputy Chief Administrative Officer Mike Labrecque says the 2006 edition of the Regional Plan gives them the right to conduct this review process, but I say is does not give HRM Staff the right to disseminate false information to the public. To me this is a fraudulent activity that Regional Council should shutdown immediately. A rebirth of the Community Stakeholders Committee (CSC) could provide us with the best way ahead. HRM has spent over $600000 to force feed the public a consultant-based waste management solution that the public never asked for, and have thus far resoundingly rejected at the two public engagements that have occurred on September 18 & 19, 2013. The flaws in the consultant's report have been pointed out as early as April 2013, but HRM Staff have not corrected them in their presentations to the public, nor even acknowledged that the flaws exist. The Community Monitoring Committee (CMC) is the public's watch-dog for Otter Lake activities, and they, along with many other sources have provided HRM Staff with documents that factually show where the flaws in the consultant's report exist. Is it any wonder that the public's faith in the integrity of municipal bureaucracy has been severely eroded? It is time for the communities who are not living adjacent to the Otter Lake facility to add their voices to that of the local communities. At some time in the future, a new landfill site will need to be established. We do not want anything less effective and safe in operation as the present Otter Lake facility to ever be established in another HRM community. Nobody wants to live near a landfill, but the last 14+ years have shown that today's Otter Lake solution is way better than the commonly implemented alternatives. Auto correct got me a couple of times in my online postings, hopefully I have fixed them all for this message. Also I added and edited some additional text. At any rate I think I get my points across. Solid Waste Community Engagement has begun. Today, HRM began community engagement on the solid waste issue when they launched the online portion on the new engagement portal: http://shapeyourcityhalifax.ca. As you may know, the Community Monitoring Committee has been opposed to the closure of the elements at the landfill facility that provide community and environmental protection to the local communities of Beechville, Lakeside, Timberlea and Prospect. In particular, Stantec recommended to HRM that they close the Front-end Processing Facility, the Waste Stabilization Facility, and reduce the liners in the landfill. Their vision is of a "truck and dump" system where there is no check on what is being brought to the landfill, it all just gets buried. That would include raw organics, recyclables, and hazardous wastes. Such a system would break provincial solid waste regulations and HRM's own written agreement with the local communities, signed when the landfill was established. Further, HRM is considering increasing the height of the landfill so it can operate 23 years longer than originally planned. Otter Lake is scheduled to close 10 years from now. HRM is now considering keeping it open until 2046. HRM is also considering building more waste management facilities at Otter Lake, including an outdoor compost curing pad for the immature compost coming out of the compost facilities in Goodwood and Burnside. That would mean that about 50,000 tonnes of organic material would be cured outdoors, only 3 kms from existing homes in Lakeside. The Minister of the Environment has told HRM they will not be allowed to close these facilities that provide community and environmental protection. The Premier and the leaders of the Liberal and Conservatives have said they will not allow HRM to close these facilities. All members of the Legislature voted to ensure these facilities are kept open. The CMC has told HRM they have a contract with the local community that precludes them from closing the facilities. Yet senior staff and Council are considering trying to do exactly that. It is your turn to speak up. Go to http://shapeyourcityhalifax.ca and tell HRM what you think about them reneging on a written agreement with the local community and turning the clock back on community and environmental protection. Get your friends, neighbours, colleagues and family members to do the same. In particular, please encourage your contacts in other parts of HRM to stand up for our community and support us online. Also, while online, take a look at the consultation schedule. In particular, there are two Town Hall meetings on September 18th and 19th at Exhibition Park, 7:00 PM to 9:00 PM. We need your help in filling Exhibition Park to overflowing on both of those days. We need to send a strong, unified message to HRM that we will not allow them to renege on their agreement to provide community and environmental protection in return for having a landfill site. Copyright © 2013 Otter Lake CMC, All rights reserved. You are getting this email because you subscribed to this list. We are preparing for the inevitable community engagement program that HRM is pursuing. The community engagement program will begin in early September. It is likely, given that HRM refuses to engage with the CMC, that we will not have any information on where, when, what, why and how until the information is made available to the public. It is clear that an important part of HRM's strategy is to dilute the Otter Lake Community input with input from communities further afield that are not affected by the proposed changes at Otter Lake. Those residents may be happy to save money by closing facilities and extending the landfill life so it will not come to them. This community engagement strategy is designed to pit other communities against ours. We would like to have people at all of the public meetings, where ever they are held. While we want to have people from our communities at each meeting, we would also like to have friendly locals as well. For instance, if there is a meeting in Fall River, we would like to have Fall River residents there telling HRM to keep its promises to the communities around Otter Lake. So, we need to engage our friends, family members, association colleagues, etcetera in joining our campaign. I ask you to reach out to others across HRM and ask them to join this mailing list so they can be informed about the campaign. If they are not going to the meetings, they can be providing online input. Everyone is a candidate for helping out. People can join this newsletter list at http://www.otterlakeCCMC.ca. The ROC is looking for individuals who would be interested in serving on the ROC Board or on any of our sub-committees as well as volunteering in any other capacity. The new Board will be voted in during our Annual General Meeting scheduled for June 17th, 2013 at 7pm at the Prospect Road Community Centre. The Resource Opportunities Centre was originally established in 1998 as the Terence Bay and Area Community Access Program (C@P). This program's focus was to build stronger communities through technology (www.nscap.ca). The site for the computers was located in the Terence Bay Elementary school and continues to provide public access to computers and the internet, computer training to people of all ages, and children's recreational programs. A satellite of this is set up in the Prospect Road Community Centre. From this program, the Resource Opportunities Centre grew to providing children's camps and activities financed by grants and run by volunteers. This has grown to providing a second physical space – the Prospect Community Centre, an organization that is financed through self sufficiency and grants. As a result of these programs there have been more than 100 employment positions created (mainly part time youth) and numerous community projects undertaken. The most significant of which (before the Community Centre) has been the Building Bridges project, 2005-2008, through which www.prospectcommunities.com was created. We currently have space available on the ROC Board and are looking for individuals with skill sets and experiences such as yours, to enrich our effectiveness as a Board. If at this time, you are not able to dedicate yourself as a Board Member please consider volunteering in another capacity. We have many sub-committees, as well as programs that could use your skills. If you would like to receive further information, such as Board by-laws, governing policies, responsibilities of a Board Member, financial statements, etc. or have any questions, please contact me at 852-1250 or email recruitment@prospectcommunities.com. We look forward to seeing you on June 17th, 2013 at 7 p.m.
Five Bridges Wilderness Heritage Trust is busy planning many exciting events that will take place in the coming weeks. Please review the listings below and join us as we enjoy our parks and wilderness area. Five Bridges Wilderness Heritage Trust invites you to its annual May Fair in the Park on Sunday, May 26. Join the Trust for children's games, BBQ and a scavenger hunt lead by the Indian Point Young Naturalists. Children will have a chance to win prizes and tour fire trucks, while the grownups learn about the many community organizations working to enhance our community. When: May 26, 2013 from 12-3p.m. *NOTE: In the event of inclement weather, the May Fair will be held at the Hubley Centre, 4408 St. Margaret's Bay Rd., Lewis Lake. 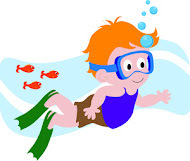 The May Meeting of the Council of Community Organizations (COCO) will be held at 7 p.m. on Thursday, May 30 at the Safety Minded ATV Club , 15 Station Rd, Head of St. Margaret's Bay. The Safety Minded ATV Club will be the host group for this meeting. There are many environmental and planning initiatives on which updates will be given including the activities of the Five Bridge Lakes Wilderness Coalition, planning for the Crossroads, the Crown Lands of Western NS (formerly Bowater lands), and the Otter Lake Landfill Site. All are welcome. For more information please contact Beth McGee at 823-2245 or John Cascadden at 852-4248. The Warbler Walk is an annual event at Jerry Lawrence Provincial Park sponsored by the Five Bridges Wilderness Heritage Trust. Five Bridges Wilderness Heritage Trust will lead a hike of the first loop of the Bluff Wilderness Trail on Sunday, June 9 at 1:00 pm. We will meet in the parking area at the trail head, located approximately 2km from exit 4 of Highway 103. Everyone is welcome to participate in a leisurely hike, approximately three hours in length, weather permitting. 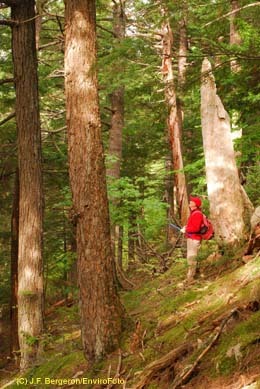 The Bluff Trail is located in the recently protected Five Bridge Lakes Wilderness Area. The trail was constructed by Woodens River Watershed Environmental Organization. Further information on the trail, including detailed directions to the trail head, can be found at www.wrweo.ca/BluffTrail. For more information, please contact Jill Pulsifer at pulsifer.j@gmail.com. 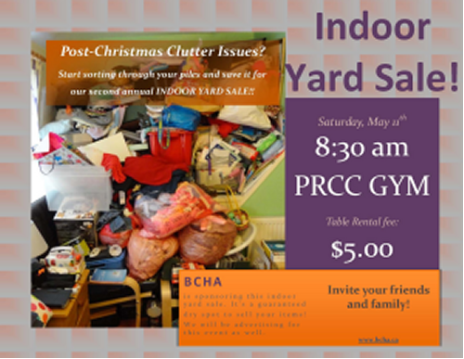 BCHA is sponsoring our second annual INDOOR yard sale! It’s a guaranteed dry spot to sell your items! We will be advertising for this event. $5 table rental (at the door - no pre-booking needed). First come first served for tables - we have the whole gym so lots of room and plenty of tables for all. Tear down will take place between 1pm and 2pm. Five Bridges Wilderness Heritage Trust is thrilled to release the second edition of the Plants of The Bluff Wilderness Hiking Trail. An official launch will be held in the community room at the Tantallon Public Library at 7p.m. on Wednesday, May 8, 2013. The Plants brochure was first published in 2005 by Five Bridges Wilderness Heritage Trust .Two Dalhousie Biology students Krystle Olsen and Dave Mealia under supervision of Dr. Mark Johnston completed the field work and compiled the first brochure with line drawings. The second edition of the brochure has full colour photos and descriptions of 17 of the most common plants found along the Bluff Wilderness Hiking Trail located within the Five Bridge Lakes Wilderness Area. The photos were provided by Ms. Olsen, Mr. Mealia, Dr. Johnston, David Patriquin and Catherine King. Everyone is welcome to attend the official launch on May 8 and pick up a copy of the new brochure. Time for a reminder to everyone that the Prospect Road Community Clean Up is coming back this May. The cleanup will be May 4th, which is shortly after Earth Day. Areas organized and covered each year usually include Terence Bay area, Brookside area, McDonald Lake area, Bayview, Sandstone, Prospect area, and the East Dover area. If you live in an area not listed but would like to be included please contact us. As well The Prospect Road Lions Club, Citizen`s on Patrol and the local Scout troop will be cleaning from the start of the Prospect Road into Goodwood and are willing to have volunteers help them with that long stretch of road even if you are not available for the entire time. Rubber gloves and garbage bags are provided by Clean Nova Scotia and TIR. These can be distributed to groups or individuals ahead of time. Sharp containers and recycle bags are also available. If you are interested in helping to organize in your community the start time for your group is entirely up to you but most groups start at 9am. If you are looking for a place to clean just let us know. Feel free to share this message with those that you know. I can be reached at jollimp@halifax.ca to assist you in planning action in your community. 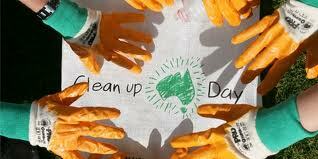 As we did last year we are able to have the midday clean up community BBQ at the Prospect Road Community Centre. The BBQ will begin at noon and run for about an hour. A couple of groups have offered to help with this part, thank you to them. A final note on the pick up of the garbage. TIR (formerly Dept of Highways and DOT) will be removing the trash after the cleanup but they need to know where it is located. Please remember to let us know where the piles are so I can share the locations with TIR. 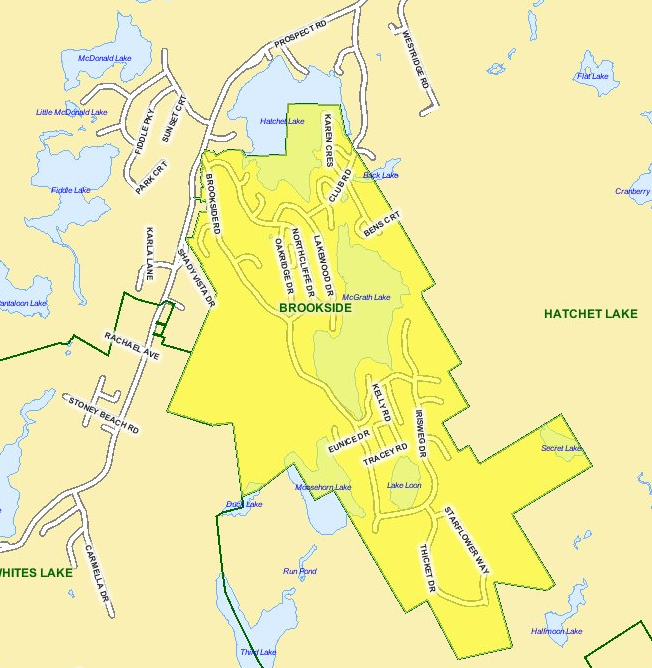 The Brookside Community Homeowners Association is continuing the theme of clean up the following weekend. Instead of the parks and ditches they are holding a community yard sale at the Prospect Road Community Centre on May 11th for those still looking to their closets and garages. For more information on the yard sale contact Valerie at info@bcha.ca. Thanks for your continued support of your community. This is a reminder that the Council of Community Organizations (COCO) will meet on April 4 at 7pm at the Hubley Center, 4408 St. Margaret's Bay Road, Lewis Lake. As you may know, HRM is proposing changes to the operation of the Otter Lake Landfill that potentially could have environmental impacts and other concerns for the community. These proposed changes do not comply with agreements made with the public in 1995 during the consultations and planning for the operation of the Otter Lake Landfill site. We are very pleased that Ken Donnelly will attend the April 4 COCO meeting to present the Community Monitoring Committee's position on HRM's proposed changes to the environmental and community protection elements of the Otter Lake Landfill. You are also invited to sign an online petition opposing the changes, which was created by Iain Rankin. The petition can be found at http://tinyurl.com/c87s84k. Regular updates from community groups will take place following Mr. Donnelly's presentation. For further information please contact Beth McGee at 823-2245 or John Cascadden at 852-4886. We hope you can join us for this important meeting. 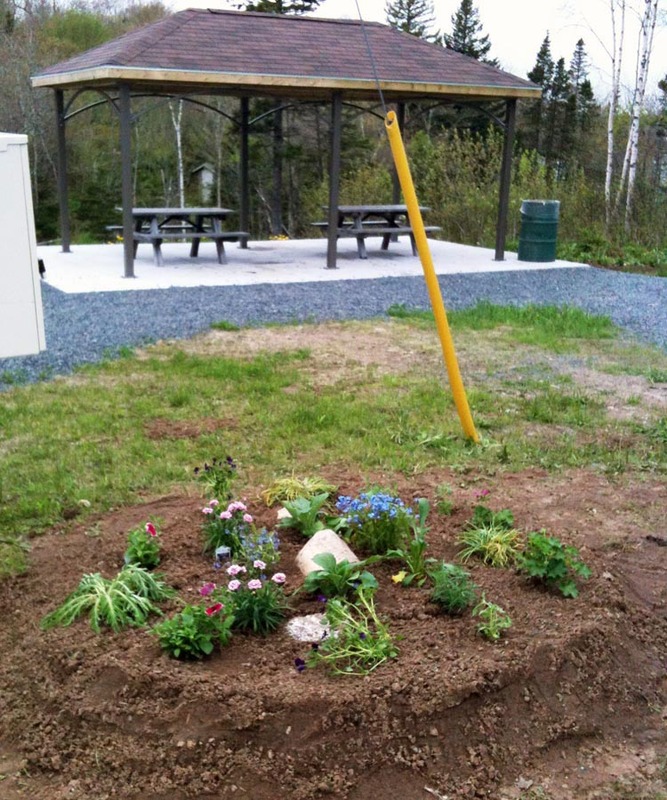 Named after the official NS Geographic place name “Lovers Cove”, this is one of our newly developed park areas in the community. Located at #58 Cathy Rd, we think of Lovers Cove as THE “picnic park” of the community. In the last few years, we’ve installed a gorgeous covered picnic shelter to promote this very use. Along with our shaded picnic area, we’ve been working on opening access to the lake for skating in the winter or launching a canoe/kayak in the summer. In 2012 we put significant work into the trail leading to the lake and created another picnic area in the shade close to the lake. We’ve noticed lots of folks using this area to cast some fishing lines into the lake and take a dip into the deep lake access at this park. Plans have been finalized for mid-late Spring this year to improve and define the parking lot and entrance. Keep your eyes peeled for this construction to start as soon as the weight restrictions are lifted from the roads! The Province is conducting public consultations on what should happen to the Crown Land in Western Nova Scotia. (see detailed notes below meeting dates). determining how the Crown Lands, our birthright, will be managed. IF YOU CARE ABOUT COMMUNITY FORESTS OR HAVE CONCERNS ABOUT THESE CROWN LANDS, PLEASE ATTEND ONE OR MORE OF THESE CONSULTATIONS, WRITE LETTERS, GET PRESS, LEAVE COMMENTS HERE – and above all MAKE YOUR VIEWS KNOWN! THE CONSULTATIONS START TONIGHT IN SHELBURNE... spread the word! All meetings will be 5-8 PM. Follow through on commitments to establish community forests. Experiences in Community Forestry throughout Canada have proven that giving communities direct control of public forests will increase environmental performance and generate more community benefits. For more information check out the exciting projects proposed by the Medway Community Forest Co-operative and the St Margaret’s Bay Community Forest. Add lands proposed through the Parks and Protected Areas Plan to the protected areas network: Western Nova Scotia is home to ecologically important tracts of old forest, rare plants and valuable endangered species habitats. Many of these lands have already been identified for protection through the Colin Stewart Forest Forum and the resulting Nova Scotia Environment’s protected areas plan but are now listed as “conditional” pending the results of the Western Crown Land public consultation. Those valuable lands need our support! In particular there are 30,000 acres on former Bowater lands (now owned by the province) that were promised by the minister for protection but are now listed as “conditional”. It appears government may be trying to claw back these areas into general Crown land so they don’t get protected and can be open to harvesting instead. Folks need to specifically speak up for the protection of these lands in both the Parks and Protected Areas Plan AND (perhaps more importantly), the Western Crown Lands consultation process. Require FSC Certification for all forestry licenses: The Forest Stewardship Council (FSC) Certification is the only forest certification system endorsed by environmental groups. Requiring certification for all forest licenses is the best measure available to ensure that forest management meets the highest standards for environmental protection and public consultation. Seek the best value from our forest resources by focusing on value-added industries: The fibre agreement with Port Hawkesbury Paper has allowed that mill to control all the wood supply from Crown land in the entire of eastern end of the province - even for products they do not actually use! This model simply can’t be applied in western NS, where as many as 15 different mills have traditionally sourced wood from the former Bowater lands alone. In order to ensure we get the best value from our forests and ultimately support a more vibrant, diverse and resilient forest economy, government must devise a tenure system that allows more mills into the market for Crown wood, with a strict focus on saw mills and value-added manufacturers, while ensuring that total harvest levels remain well within the limits of ecosystem-based forestry. Make public engagement a requirement of forest licensees. Many tools are available to facilitate better transparency and collaboration with respect to forest management on Crown lands, such as the interactive online mapping tool used in the protected areas consultation. Nova Scotians should be given on-going opportunities to participate in collaborative management of Crown lands and greater efforts should be made to provide transparency and accountability of industries that operate on our public lands. Don’t give all the wood away through long term license agreements:– British Columbia is allocating up to 10% of its annual cut from Crown land to help prove stumpage rates. Nova Scotia should follow suit and keep our options open for new wood uses, innovative value-added manufacturers and new community forestry projects. Enforce meaningful forest practice reforms: The government’s once promising clearcut reduction policy has been sidelined by a weak definition of what doesn’t constitute a clearcut. Any policy aimed at reducing clearcutting and moving the province towards true ecologically-based forest management must specifically endorse and facilitate the shift towards uneven-aged management – where a standing, intact forest ecosystem remains in place following partial harvesting. Thanks for your support of the Community Forest concept!.